ARCHENEMIES Cover Reveal, Touring Info, + News! And now – I have so much news! First: The BIG exciting announcement that RENEGADES is now a trilogy! That’s right, I’m thrilled to announce that there will be a total of three books in the series. 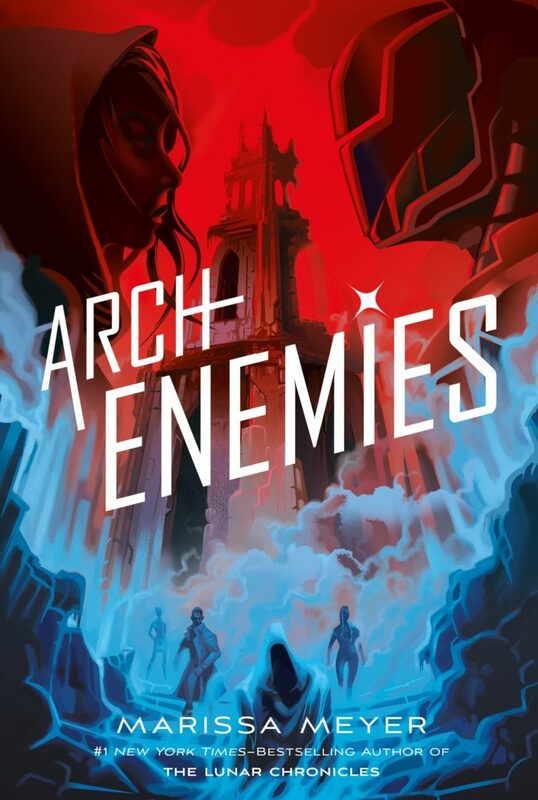 Second: I have a cover to share for Archenemies and how amazing is it?! I love it and can’t wait to share the book with you on November 6! 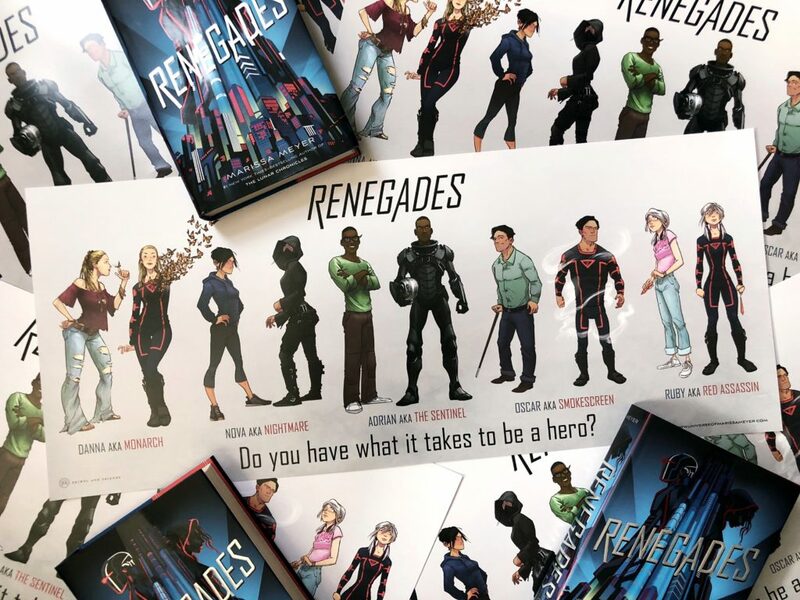 Third: Have you seen the RENEGADES character art posters? 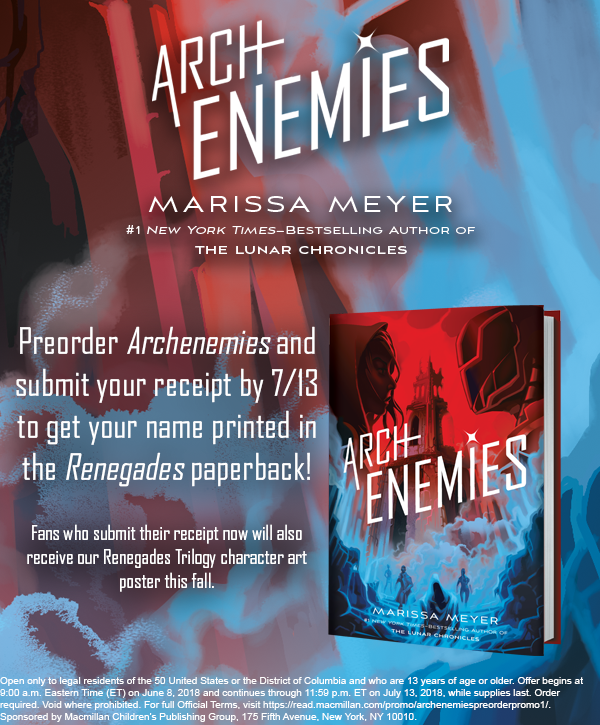 You can preorder ARCHENEMIES now. Fourth (Fifth? I’ve lost count): Tour information! Plus, I’ll be on the Fierce Reads tour in October, and again on book tour for Archenemies when it releases in November! All dates and locations to come. I will announce tour details here and in my newsletter when I have them. First!! Can’t wait for Archenemies!! And so sorry about your leg Marissa! I just got my friend to read Renegades, and she liked it! This is great, because no one ever reads the books I recommend…so Renegades is a first! Also, I CAN’T WAIT! Can’t Archenemies be out already? I really don’t want that to sound rude, I’m just really excited, and thus new cover and description are definitely making me more! Do you know Spanish? If not, you may utter a sentence, then hear the interpreter go on for three or four sentences while you wonder what is going on. Selene is AWSOME, I actually became friends with a really good friend of mine because of The Lunar Chronicles! I saw her reading Heartless on the first day of school (but couldn’t tell it was Heartless because I just saw the back cover, which had the “also by Marissa Meyer: the Lunar Chronicles thing), and said, “Oh I love The Lunar Chronicles!” She was like, “Really, really, really, really!!! I know, aren’t they so great!” Now we read all sorts of books and talk about them! Mark Murta, I take Spanish, but what does Spanish really have to do with the new cover? I like to design your cover, look it very mysterious combination of hot and cold! The plots can be an inconsequential animation at the time, but the TV endured trying to take a lead of James Bond’s madness. I had some toys once I was a kid and I did this reply from memory. Search Wikipedia if you essential more. I’m so hyped for the new book to come out! I’ve been waiting for a year! Thanks my friend this is great and fantastic topic also is helpful i love this weblog so much. 1 WEEK TO GO!!!!! AHHHHHH!! Renegades was the first book I ever read of Marissa meyer, and I loved it. I still remember how I was counting down the months till the nest book released. And now I am counting down for the third book. I really hope to meet Ms.Meyer in person. Crossing my fingers and wishing that someday she visits Dubai for one of her book tours. This is a stunning idea. Looks amazing and looks delicious.